Crawley Rugby Football Club is located at a purpose-designed and built site on the outskirts of the town. Boasting excellent facilities we are the envy of many of our peers in the county. Four pitches, two of which are floodlit, eight changing rooms each with their own showers, a well equipped gym and weights room combined with a modern clean clubhouse with a large, friendly bar open all year round. With 500+ members and growing fast Crawley RFC is an inclusive club with a passion to bring the enjoyment of rugby to the wider community whatever the age, gender or capability. We currently have three senior sides and a thriving and rapidly expanding youth section with teams at every age from U7’s through to U18’s many of whom continue into the senior playing squads. During past seasons one of our youth players has been awarded England youth honours and a number of players have represented Sussex. Our senior section has seen success over the past few seasons seeing the 1st XV promoted and with an aim to grow and drive the 1st XV to further heights over the coming seasons, we are set for an exciting few years ahead with some superb rugby. As an amateur club, we are run purely by volunteers giving their free time and we rely on the member’s subscriptions to pay our way but being an amateur club doesn’t mean that we lack ambition – on the contrary we are determined to play the best standard of amateur rugby that we can while supporting school and community initiatives to give children an introduction to the game and to raise the profile of Crawley RFC and rugby in a positive manner. Crawley hosts several events for local schools with over 200 children attending the schools tag event annually in October as well as hosting the season curtain raiser for the county Under 9’s and 10’s and the West Sussex Festival in 2010 and set to host again in 2013. 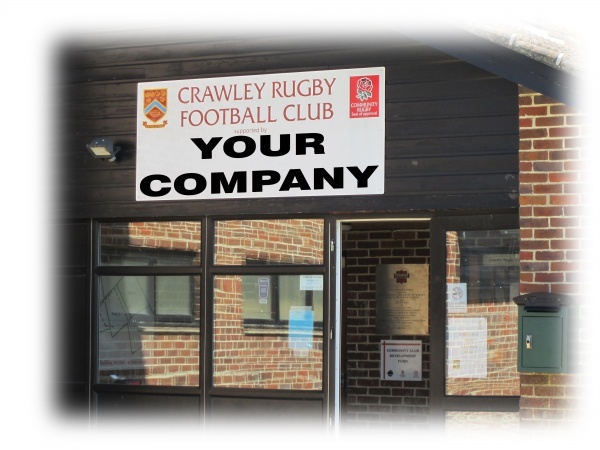 There has been a huge surge of interest in rugby in recent years and the game has numerous positive messages, which reflect well on businesses associated with it and as a fast emerging club with first class credentials it is an excellent time to become associated with Crawley RFC. We have opportunities for local businesses to get involved and benefit from the positive messages that rugby extols while getting access to our membership as well as to the many visiting clubs playing matches throughout the season. Our 2012/13 sponsorship packages are in a format that will hopefully appeal to businesses large and small. If you have your own ideas, which aren’t listed, please let us know and we will be happy to discuss them. There really hasn’t been a better time to get onboard with Crawley RFC, the business climate is tough but we have a range of opportunities for every budget, which offer not only good commercial value but some fun to boot. Our website receives over 2000 hits per day and during the rugby season we are featured regularly in local newspapers– and of course our 500+ members – all in all a compelling package.